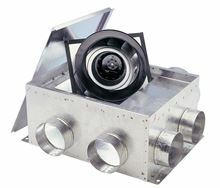 The Fantech CVS 400a lightweight circular duct fans have been engineered for installation in areas with limited space, such as between floors in apartments buildings or high rise suites. The multi-port direct driven centrifugal fan can exhaust up to several points and multiple applications into one central point without the use of adapters or transitions. The motorized impeller is both statically and dynamically balanced as one integral unit, for vibration-free and whisper-quiet performance. Multi-unit housing makes incredible demands on ventilation. Fantech's CVS Series inline duct fans are designed to meet those challenges with ease. 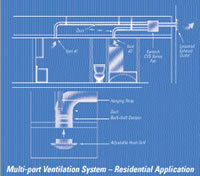 Use for Multi room residential ventilation such as bathroom and other living spaces. Use for commercial spaces where ventialtion improvments are required.